The Federation of Small Businesses (FSB) is a national body that acts as a movement on behalf of small businesses. 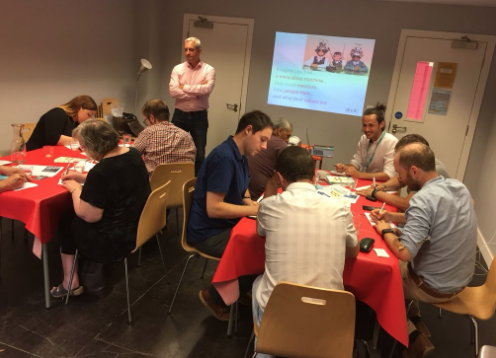 I was invited along to one of their meetings to talk about Mindsonar and thinking styles and to see how that can influence individuals in business for success. I entitled the talk ‘Thinking Makes It So’ and there was an eclectic mix of guests from the world of volunteering and IT – to GDPR consultants and LoyalFree (the @Loyalfreeapp was in the room). Crucially, they were a fantastic group to work with. They really took thinking styles and MindSonar on board and fully engaged with the activities we did. I like to think that they got a lot out of it as well. A 20-minute presentation ended up being over an hour long as I was asked to keep going when the 20 minutes were up. I had started the presentation with a general discussion examining how people think and how they approach their strengths and blind spots. Studies show that many small businesses fail within the first five years. It’s not that they are mainly doing anything wrong, it’s just that they don’t do things right. It is so important to know what you are not good at and making the decision to get other people to do those parts of your business for you. Working in pairs, I got them to ask each other about their thinking styles in relation to their business. I asked what was important to them. This question elicited their beliefs and values. Using precise questions (meta programme language questions) together, we decoded their style. It led to a few knowing nods and giggles. Were they someone who worked towards goals or did they try to avoid problems and find solutions? Were they someone who sourced their information from within or from others? Were they internally referenced or externally referenced? Were they driven by possibilities or did they follow procedures? We looked at the pros and cons of those thinking styles, and the group found that process really insightful and hopefully useful for the future. In summary, we said that most of us know what we are not good at, but rarely give ourselves much credit. We asked why would we use personality profiles that label us – as opposed to one that establishes how we think in a given context, like Mindsonar. We should use a thinking style tool when we need to know how our customers and us think and, therefore, behave. We all know the pressure points or hot buttons for winding people up with things they are not good at – especially our partners – but it can be mighty to remind people of the things they excel at. It can be a powerful motivational tool in business and at home mainly if we use the right motivational language! We closed the session by looking at the Mindsonar psychometric profiles of two people at their best, and the group used the crib sheets I had prepared to analyse them. Everyone applied what he or she had learned and did extremely well. Thanks to the FSB and everyone who was there for what turned out to be a delightful session. Copyright © 2017 Workforce Solutions Group. All rights reserved. Website design in Leicestershire by Buzz.